takes you through some of Tanzania’s finest National Parks for an exciting Safari experience. This Safari is available as a Join-In Safari with minimum 2 persons guaranteed departure and maximum of 6 persons in a 4WD Safari Landcruiser. 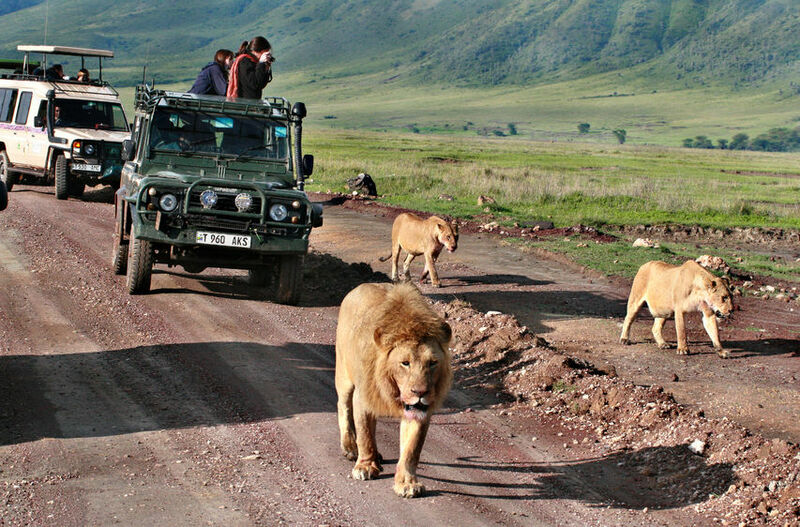 Departures for the Tanzania Simba Safari package is from Arusha on every Sunday and Wednesday. Tanzania Simba Safari includes the game-rich parks of Tarangire, Lake Manyara, Serengeti and Ngorongoro Crater for a full wildlife experience of Tanzania Northern National Park. Safari in Lake Manyara National Park in the Great Rift Valley. Ngorongoro Crater – The Eighth Wonder of the World; rising high above the Serengeti plains, a vast, natural amphitheatre rich in wildlife. The Serengeti National Park is a magnificently vast expanse of savannah where lions, cheetahs and hyenas stalk their prey. Tarangire National Park offers wonderful scenery and wildlife. The park’s resident animals include large herds of elephants, giraffes, many types of antelopes, and leopards. Indisputably one of Africa’s true wonders of nature and an extraordinary place of haunting beauty, with its grand majestic mountain ring and lake, pinkly shimmering in the blue grey haze. Ngorongoro Crater is a huge caldera (collapsed volcano) 300 square km in size, 19.2 km in diameter and 600 meters deep. It is home to one of the world’s largest inactive and unflooded volcanic calderas with a rich diversity of Tanzania wildlife safari(including some of Tanzania’s last remaining black rhino), and the famous paleontological site of Oldovai Gorge nearby. The conservation area is also home to Masai people and their cattle which co-exist with the existing wildlife in a unique ecosystem. Located 125 km west of Arusha town, under the wall of the Great Rift Valley, Lake Manyara National Park is one of the oldest and most popular sanctuaries in East Africa. It is the vast number of magnificent baobab trees that first capture the eye as you enter Tarangire National Park. The gently rolling countryside is dotted with these unusual trees, which seem to dwarf the animals that feed beneath them. During the dry season (June to October) there is an annual animal ‘migration’ into the park, as wildlife travels from other areas into the park to quench their thirst in the waters of the Tarangire River. During this period, the park has the largest concentration of animals in any park in northern Tanzania. Contact us to upgrade to a Private Safari option on same routing. The Serengeti is the jewel in the crown of Tanzania’s parks and undoubtedly the best-known wildlife sanctuary in the world. With countless predators including lion, cheetah and leopard, more than two million wildebeest, half a million Thomson’s gazelle, and a quarter of a million zebra, it has the greatest concentration of wildlife on our planet. The wildebeest and zebra moreover form the star cast of a unique spectacular – the annual migration. Month-to-month wildebeest migration pattern will assist you in planning your memorable Tanzania Migration Safari. Between May and July you might be lucky to witness the fascinating spectacle of thousands of Wildebeest and Zebras crossing the crocodile infested Grumeti River together with their new born. From August to October, they move to the remote Northern Serengeti crossing the Mara River which is equally populated with giant Nile crocodiles. There is a variety of scenery, which include the plains, lakes, hills and the rock outcrops called kopjes. The main game drive areas in the Serengeti are the Seronera Valley, the Western Corridor, and Lobo or northern Serengeti. The Seronera valley in central Serengeti endowed with permanent surface water attract a large concentration of wildlife throughout the year. Common animals that can be seen here are lions, buffaloes, impalas, hippos, waterbucks, elephants, cheetahs and the leopard. Serengeti provides sanctuary to the highest concentration of plains animals in the world. Once thought to be higher than Mt. Kilimanjaro before exploding, the crater is an iconic wilderness and safari destination. Linked to the Serengeti the two areas, as we know them today, were formed at the same time. With the explosion the crater was formed. Time and wind ensured ground cover and vegetation taking hold and producing one of the most nutritious eco-systems on earth. There are said to be 25 000 animals living in the crater, many of which are permanent residents. It can get quite cold at night and in the early morning at Ngorongoro so make sure to pack appropriate attire. A perfect extension after a thrilling Tanzania Simba Safari is a four night Zanzibar Island Beach Holiday staying at an All Inclusive Beach Resort. See Zanzibar Beach Holidays for options or contact us to design a suitable package inclusive of flights from Kilimanjaro Airport. Hot air ballooning over the vast Serengeti plains is the ultimate game viewing experience. Arrive at your launch site before dawn; take off as the sun rises over the hills. Your journey gives you a bird’s eye view of the wildlife as you look for leopard in the branches of acacia trees. After your sixty minute ride, you are met by the ground crew for the traditional “Champagne toast” followed by a magnificent breakfast, cooked and served on the Serengeti. The special cost for this optional excursion is £365 per person when purchased with Tanzania Simba Safari. Collection from your Arusha Hotel. Your safari begins with a drive to Tarangire National Park well known for its huge herds of elephants and buffalo, as well as lion, cheetah and leopard. Tarangire offers wonderful scenery and wildlife. The park’s resident animals include large herds of elephants, giant pythons, giraffes, many types of antelopes, and leopards, to name just a few. Morning game viewing before you travel to Gibbs Farm for a delicious farmhouse lunch. In the afternoon continue to Ngorongoro Crater for your stay at the Lodge. After breakfast, transfer down to the crater for a day of game viewing. Packed lunch will be provided. The first light of the day sends its golden shafts under the ethereal mist and fog hovering on the rim to spill in puddles of gold on the Crater floor far below. The Crater is a huge caldera or collapsed volcano, 12 miles across, providing a Garden-of-Eden like home for the thousands of animals that live there. After breakfast proceed to Serengeti via Olduvai Gorge, made famous by the Leakey Family who began their excavations here in 1931. Abundant fossil material dating back more than a million years, including hominid remains of Zinjanthropes bossei, have been discovered here. Continue to Serengeti National Park. Full day of game drives in the Serengeti with either packed or hot lunch depending on the movement of the animals. The Serengeti is world famous as the home of a million and a half wildebeest and zebra. There are a multitude of the other plains animals (more than 35 species) to see, as well as hippos, giraffes and black manned lions. Morning drive to Lake Manyara in the Great Rift Valley. Afternoon game drive. The park has a large variety of habitats, making it possible to support a wealth of wildlife in its small area. Breakfast and transfer to Arusha. Option: Transfer for your return flight from Kilimanjaro Airport or proceed with your chosen beach extension to Zanzibar. The Tarangire Sopa Lodge, built as a ‘low profile’ structure, nestles into a wooded hillside valley overlooking Tarangire Hill. The Lodge offers spacious rooms with excellent views over the bush. 75 spacious rooms, all with a private lounge and mini bar. Each room is carpeted, has 2 queen size beds with mosquito nets. Ceiling fans keep the rooms cool and glass sliding doors that open out on to a balcony, with a great view of the landscape beyond. Swimming Pool, outdoor and indoor dining areas, coffee shop, bar. Serengeti Sopa Lodge is nestled in the acacia woodland on the edge of the escarpment overlooking the plains of the south-western Serengeti National Park, one of the most famous parks in the world, and host to the largest and most spectacular annual migration of the wildebeest. Serengeti Sopa Lodge is an all-suite property, each of its 75 suites featuring spacious bathrooms, a private lounge with mini-bar and a sliding “window wall” giving access to a balcony or verandah which enjoys uninterrupted views of the Serengeti. The Serengeti Sopa Lodge is the only lodge in the Serengeti offering quad rooms (two queen size beds) suitable for a family of four including two small children. Main public areas with high ceilings, enjoy magnificent views into the crater through double story windows. Open fireplaces are features of the bar, lounge and dinning room. There is a bracing “high altitude” swimming pool overlooking the Crater. Dramatically set on the edge of the Mto wa Mbu escarpment, Lake Manyara Serena offers breathtaking views of the Great Rift Valley and beautiful Manyara Soda Lake. Perched on the very edge of the cliffs, with stunning views over the lake is the pool bar and observation point. The lodge has a total of 67 en-suite guest rooms with verandahs with spectacular views over the escarpment, and down to Lake Manyara National Park. Infinity Pool, internet, outside dining terrace, central dining and bar, bush dinner site within the grounds, conference room, gift shop, small Spa, business centre. 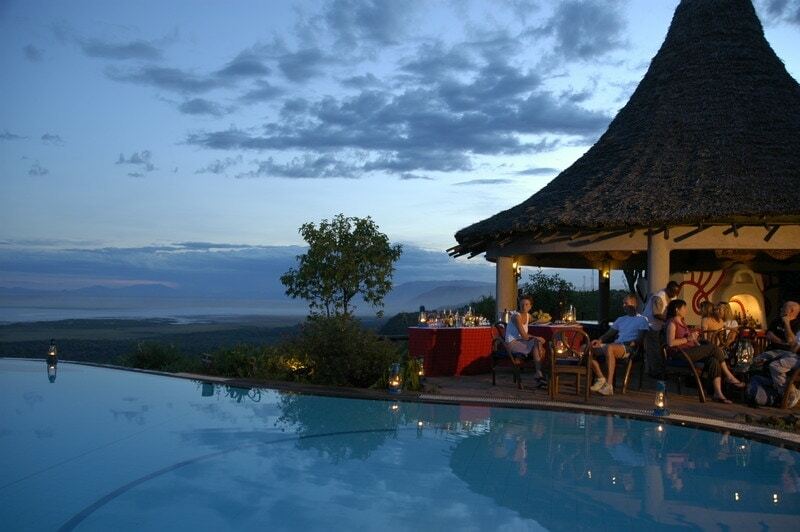 The Ngorongoro Sopa Lodge is perched on the eastern rim of the world-famous Ngorongoro Crater. At an altitude of 7,632 feet, this location offers remarkable views of the sleeping Crater floor below. Being the only accommodation on the Eastern Rim, the Lodge offers stunning panoramic views of the daily sunset over the far western rim… a sight you will not soon forget. An easy access road to the Crater floor maximizes early morning game-viewing. Each of the 96 rondavel-style suites has a spacious bathroom, a private lounge with mini-bar, an enclosed “solarium verandah” and is fully central heated. Maramboi Tented Camp offers is located with endless vistas of rolling golden grasslands and palm lined desert between Tarangire and Manyara Lake. The camp offers stunning views of the Manyara National Park, Rift Valley, Ngorongoro highlands and on clear days even Oldonyo Lengai a sacred mountain to the Masai. 40 spacious tents are built on wooden decks, comprising of 26 standard rooms, 10 suites and 2 units with 2 rooms interconnected, ideal for families with children. They all have en suite facilities and private verandas. Swimming Pool, Internet, outside and inside dining, Bar. Activities include, game drives, bird watching on the shores of the not too distant Lake Manyara and cultural interaction with Datoga and Masai tribes, whose bomas populate the adjacent land. 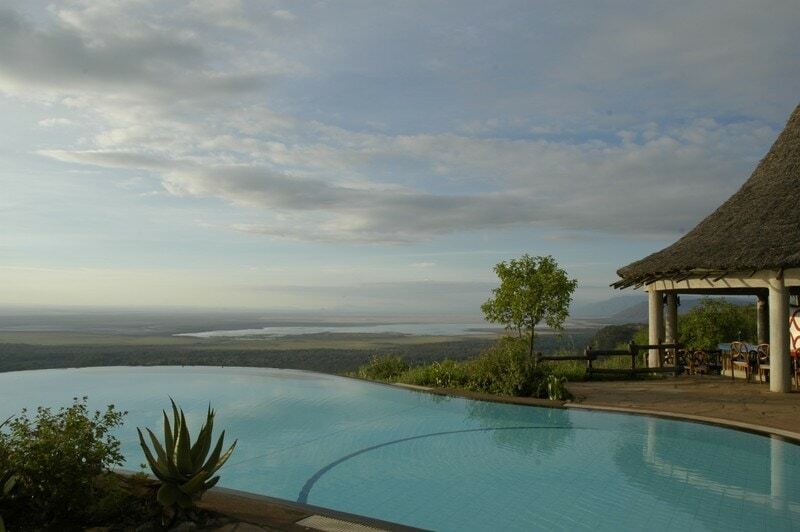 Kirurumu Manyara Lodge is set high on the edge of the Great Rift Valley, enjoying a panoramic view over Lake Manyara and the Rift Valley floor. The rooms are tented and raised off the ground with a wooden decking, of which each has an amazing view of the Great Rift Valley of Lake Manyara National Park. * 2 honeymoon suites and 2 family cottages. * Fully ensuite bathrooms, hot and cold powerful showers with solar-heated spring water. A number of activities include mountain biking and trekking for a morning or afternoon session or cultural/nature walks accompanied by a Masai guide. Tarangire River Camp provides guests with a traditional safari experience, with the vast and diverse landscape of Tarangire National Park stretching out before them. 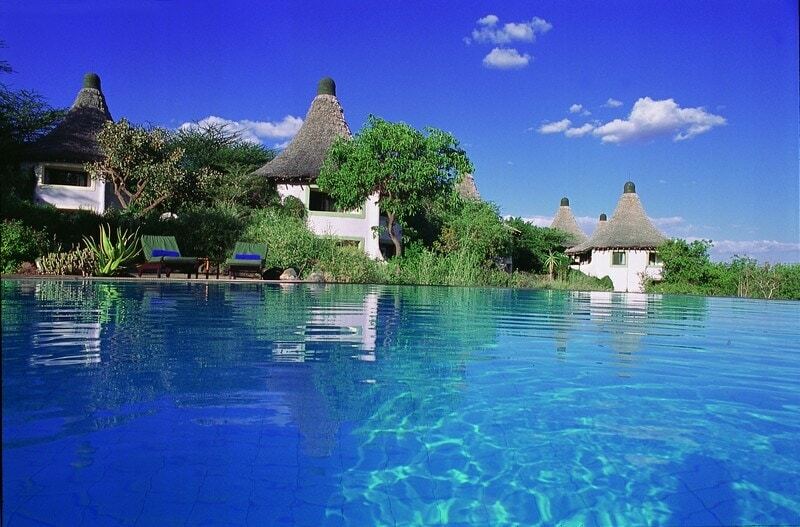 The lodge overlooks a branch of the Tarangire River and is a prime location for game viewing. There are 18 luxury safari tents within the 25,000 hectares. Each tent is on a raised wooden platform with a thatched roof above and features en-suite bathrooms. Elegant meals are served in the shaded dining tent by baobab and acacia groves. The camp provides a main area which is used as a lounge and dining area, with a second floor acting as a viewing platform. A small and exclusive lodge facing the Oldeani Volcano, 5 kilometers from the Ngorongoro Lolduare gate. 52 room cottages, 49 standard rooms and 3 suite rooms, all with ample space inside, built on the style of an old colonial farm and rustically decorated with local materials. 66 rondavel rooms with ensuite bathrooms and balconies with views across the Serengeti plains. Conference centre, Cultural dance and music,TV room with satellite TV. Serengeti Kati Kati is a mobile tented camp located in Central Serengeti, strategically located to cover the vast Serengeti Plains. The camp offers comfortable accommodation and a unique opportunity to enjoy a real safari camp experience. The Lodge has 75 en suite rooms, with private terraces and uninterrupted views of the 102 square mile crater floor rich in wildlife. Decorated with cave paintings, the rooms are strung around the Crater rim. Each has its own rock- enclosed balcony, and all enjoy completely uninterrupted views of the volcanic amphitheatre far below. Tloma Lodge is an exclusive lodge situated within the Ngorongoro Highlands Area.The excellent location of Tloma Lodge on the raised shoulder of a valley, offers breathtaking views over a coffee-plantation and onto the Eastern wall of the magnificent Ngorongoro Crater. 36 spacious rooms. 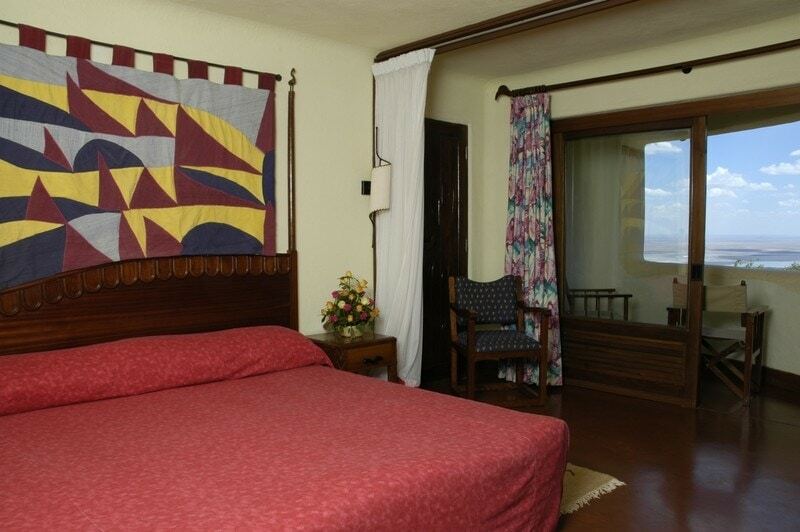 All rooms have views to Ngorongoro Highlands. There are king, twin and triple sized rooms. • 6 Nights Full Board Accommodation as in Itinerary. • Transportation in a 4×4 Safari Vehicle with pop up roof for easy game viewing & photography. • Services of an English speaking driver-guide, game viewing drives and park entrance fees. Tanzania Visas currently US$ 50 per person available for purchase on arrival Kilimanjaro Airport.